Making money with a mobile application is not an easy thing. Gartner is forecasting that, by 2017, 94.5 percent of mobile downloads will be for free apps. They even predict that through 2018, less than 0.01 percent of consumer mobile apps will be considered a financial success by their developers. Yes, they forecast that only one (1) out of 10,000 developers will make enough money to survive and stay in business. Slingboards Lab (my start-up company) want to be part of the survivors. This is why, last summer, even before starting the development of our mobile app, we have clearly defined a compelling business model. Our business model is the fundamental way that we plan to make money from our application. Since we do not have thousands of loyal customers, an established brand or something very special and desirable, we believe that the model of paid apps is not sustainable for our environment. In addition, in 2013, only about 10 percent of mobile applications in the Apple app store have been paid, and this percentage has been declining for years. For these reasons (rational justification), and especially because we liked the idea of offering free software (emotional justification), we opted instead for the model of freemium apps. 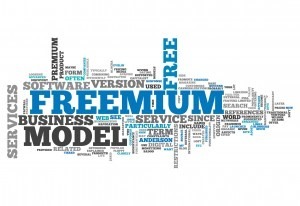 Freemium is a business model in which you give a core product away for free to a large group of users and sell premium features to a smaller fraction of this user base. The goal is to offer a fantastic product with limitations. The basic feature will be satisfying to the point that customers can remain on the product for free. However, because we will offer outstanding user experience, we believe that with time they will be hungry for more – seeking out the paid product to enhance their experience and broaden their engagement with our services. A common misconception is to believe that all business models that involve the use of free products are freemium models. There are three other business models centered on a free product, which are commonly used; direct cross-subsidy, ad-supported and gift economy. Chris Anderson’s wrote a great post about the four kinds of free. If you are planning to build and launch a mobile application for the consumer market, attracting users and keep them “hooked” is what you should be concerned with. Business success will depend on raving fans, customers who will buy the premium version of your software. In 2014, mobile apps with freemium models account for 98% of the revenue in the Google app store and 95 % in the Apple app store. With such facts, and because we will be competing with free anyway, it seems that only a freemium business model can emerge with success. Categories: Lean Startup | Tags: value proposition, Vision | Permalink.